1 [I would lift] my voice to God and cry; [I would lift] my voice to God, that He may give ear to me. 2 In the day of my straits I sought the Lord: My hand was stretched out in the night without ceasing; My soul refused to be comforted. 3 [When] I remember God, I must sigh; [When] I muse, my spirit is covered [with gloom]. Selah. 4 Thou hast held open the guards of my eyes: I am buffeted, and cannot speak. 5 I considered the days of old, The years of ancient times. 6 I would remember my song in the night: In my heart I would muse,--and my spirit made anxious search. 7 Will the Lord cast off for ever? And will He continue no more to be favourable? 8 Is His loving-kindness ended for ever? Has His promise failed for all generations? 9 Has God forgotten to be gracious? Or has He in anger drawn in His compassions? Selah. 10 Then I said, It is my sickness; [But I will remember] the years of the right hand of the Most High. 11 I will celebrate the deeds of Jah; For I will remember Thy wonders of old. 12 And I will meditate on all Thy work, And will muse on Thy doings. 13 O God, in holiness is Thy way: Who is a great God like God? 14 Thou, Thou art the God who doest wonders: Thou hast made known among the peoples Thy strength. 15 Thou hast redeemed with Thine arm Thy people, The sons of Jacob and Joseph. Selah. 16 The waters saw Thee, O God; The waters saw Thee, they writhed in pangs: Yea, the abysses trembled. 17 The clouds were poured out [in] water; The skies gave [forth] a voice: Yea, Thine arrows went to and fro. 18 The voice of Thy thunder was in [Thy] chariot wheel; Lightnings illumined the world: The earth trembled and shook. 19 In the sea was Thy way, And Thy paths in great waters, And Thy footprints were not known. 20 Thou leadest Thy people like sheep, By the hand of Moses and Aaron. The occasion of the profound sadness of the first part of this psalm may be inferred from the thoughts which brighten it into hope in the second. These were the memories of past national deliverance. It is natural to suppose that present national disasters were the causes of the sorrow which enveloped the psalmist's spirit and suggested questions of despair, only saved from being blasphemous because they were so wistful. But it by no means follows that the singer is simply the personified nation. The piercing tone of individual grief is too clear, especially in the introductory verses, to allow of that hypothesis. Rather, the psalmist has taken into his heart the troubles of his people. Public calamity has become personal pain. What dark epoch has left its marks in this psalm remains uncertain. If Delitzsch's contention that Habakkuk iii. is in part drawn from it were indubitably established, the attribution of the psalm to the times of Josiah would be plausible; but there is, at least, room for doubt whether there has been borrowing, and if so, which is original and which echo. The calamities of the Exile in their severity and duration would give reasonable ground for the psalmist's doubts whether God had not cast off His people for ever. No brief or partial eclipse of His favour would supply adequate occasion for these. The psalm falls into two parts, in the former of which (vv. 1-9) deepest gloom wraps the singer's spirit, while in the latter (vv. 10-20) the clouds break. Each of these parts falls into three strophes, usually of three verses; but in the concluding strophe, consisting of five, Selah stands at the end of the first and third, and is not present at the end of the second, because it is more closely connected with the third than with the first. In like manner the first strophe of the second part (vv. 10-12) has no Selah, but the second has (vv. 13-15); the closing strophe (vv. 16-20) being thus parted off. The psalmist's agitation colours his language, which fluctuates in the first six verses between expressions of resolve or desire (vv. 1, 3, 6) and simple statement of fact (vv. 2, 4, 5). He has prayed long and earnestly, and nothing has been laid in answer on his outstretched palm. Therefore his cry has died down into a sigh. He fain would lift his voice to God, but dark thoughts make him dumb for supplication, and eloquent only in self-pitying monologue. A man must have waded through like depths to understand this pathetic bewilderment of spirit. They who glide smoothly over a sunlit surface of sea little know the terrors of sinking, with choked lungs, into the abyss. A little experience will go further than much learning in penetrating the meaning of these moanings of lamed faith. They begin with an elliptical phrase, which, in its fragmentary character, reveals the psalmist's discomposure. "My voice to God" evidently needs some such completion as is supplied above; and the form of the following verb ("cry") suggests that the supplied one should express wish or effort. The repetition of the phrase in 1 b strengthens the impression of agitation. The last words of that clause may be a petition, "give ear," but are probably better taken as above. The psalmist would fain cry to God, that he may be heard. He has cried, as he goes on to tell in calmer mood in ver. 2, and has apparently not been heard. He describes his unintermitted supplications by a strong metaphor. The word rendered "stretched out" is literally poured out as water, and is applied to weeping eyes (Lam. iii. 49). The Targum substitutes eye for hand here, but that is commentary, not translation. The clause which we render "without ceasing" is literally "and grew not stiff." That word, too, is used of tears, and derivatives from it are found in the passage just referred to in Lamentations ("intermission"), and in Lam. ii. 18 ("rest"). It carries on the metaphor of a stream, the flow of which is unchecked. The application of this metaphor to the hand is harsh, but the meaning is plain--that all night long the psalmist extended his hand in the attitude of prayer, as if open to receive God's gift. His voice "rose like a fountain night and day"; but brought no comfort to his soul; and he bewails himself, in the words which tell of Jacob's despair when he heard that Joseph was dead. So rooted and inconsolable does he think his sorrows. The thought of God has changed its nature, as if the sun were to become a source of darkness. When he looks up, he can only sigh; when he looks within, his spirit is clothed or veiled--i.e., wrapped in melancholy. In the next strophe of three verses (vv. 4-6) the psalmist plunges yet deeper into gloom, and unfolds more clearly its occasion. Sorrow, like a beast of prey, devours at night; and every sad heart knows how eyelids, however wearied, refuse to close upon as wearied eyes, which gaze wide opened into the blackness and see dreadful things there. This man felt as if God's finger was pushing up his lids and forcing him to stare out into the night. Buffeted, as if laid on an anvil and battered with the shocks of doom, he cannot speak; he can only moan, as he is doing. Prayer seems to be impossible. But to say, "I cannot pray; would that I could!" is surely prayer, which will reach its destination, though the sender knows it not. The psalmist had found no ease in remembering God. He finds as little in remembering a brighter past. That he should have turned to history in seeking for consolation implies that his affliction was national in its sweep, however intensely personal in its pressure. This retrospective meditation on the great deeds of old is characteristic of the Asaph psalms. It ministers in them to many moods, as memory always does. In this psalm we have it feeding two directly opposite emotions. It may be the nurse of bitter Despair, or of bright-eyed Hope. When the thought of God occasions but sighs, the remembrance of His acts can only make the present more doleful. The heavy spirit finds reasons for heaviness in God's past and in its own. The psalmist in his sleepless vigils remembers other wakeful times, when his song filled the night with music and "awoke the dawn." Ver. 6 is parallel with ver. 3. The three key-words, remember, muse, spirit, recur. There, musing ended in wrapping the spirit in deeper gloom. Here, it stings that spirit to activity in questionings, which the next strophe flings out in vehement number and startling plainness. It is better to be pricked to even such interrogations by affliction than to be made torpid by it. All depends on the temper in which they are asked. If that is right, answers which will scatter gloom are not far off. The comparison of present national evils with former happiness naturally suggests such questions. Obviously, the casting off spoken of in ver. 7 is that of the nation, and hence its mention confirms the view that the psalmist is suffering under public calamities. All the questions mean substantially one thing--has God changed? They are not, as some questions are, the strongest mode of asserting their negative; nor are they, like others, a more than half assertion of their affirmative; but they are what they purport to be--the anxious interrogations of an afflicted man, who would fain be sure that God is the same as ever, but is staggered by the dismal contrast of Now and Then. He faces with trembling the terrible possibilities, and, however his language may seem to regard failure of resources or fickleness of purpose or limitations in long-suffering as conceivable in God, his doubts are better put into plain speech than lying diffused and darkening, like poisonous mists, in his heart. A thought, be it good or bad, can be dealt with when it is made articulate. Formulating vague conceptions is like cutting a channel in a bog for the water to run. One gets it together in manageable shape, and the soil is drained. So the end of the despondent half of the psalm is marked by the bringing to distinct speech of the suspicions which floated in the singer's mind and made him miserable. The Selah bids us dwell on the questions, so as to realise their gravity and prepare ourselves for their answer. The second part begins in ver. 10 with an obscure and much-commented-on verse, of which two explanations are possible, depending mainly on the meanings of the two words "sickness" and "years." The former word may mean "my wounding" or "my sickness." The latter is by many commentators taken to be an infinitive verb, with the signification to be changed, and by others to be a plural noun meaning "years," as in ver. 6. Neglecting some minor differences, we may say that those who understand the word to mean being changed explain the whole thus: "This is my wound (misery, sorrow), that the right hand of the Most High has changed." So the old versions, and Hupfeld, Perowne, and Baethgen. But the use of the word in ver. 6 for "years" creates a strong presumption that its sense is the same here. As to the other word, its force is best seen by reference to a closely parallel passage in Jer. x. 19--"I said, Truly this is my grief (margin, sickness), and I must bear it"; where the word for grief, though not the same as in the psalm, is cognate. The most probable meaning, then, for the expression here is, "This my affliction is sent from God, and I must bear it with resignation." Then follows an elevating thought expressed in its simplest form like an exclamation, "the years," etc.--i.e.,, "I will remember (comp. ver. 6) the time when the right hand of Jehovah had the pre-eminence" (Cheyne, in loc.). Delitzsch leaves the ellipsis unfilled, and takes the whole to mean that the psalmist says to himself that the affliction allotted will only last for the time which the mighty hand of God has determined. The rendering adopted above avoids the awkwardness of using the same word in two different senses in the same context, yields an appropriate meaning, especially in view of the continual references to remembering, and begins the new strophe with a new note of hopefulness, whereas the other renderings prolong the minor key of the first part into the second. It is therefore to be preferred. The revolution in feeling is abrupt. All is sunny and bright in the last half. What makes the change? The recognition of two great truths: first, that the calamity is laid on Israel, and on the psalmist as a member of the nation, by God, and has not come because of that impossible change in Him which the bitter questions had suggested; and, second, the unchangeable eternity of God's delivering power. That second truth comes to him as with a flash, and the broken words of ver. 10 b hail the sudden rising of the new star. "There shall never be one lost good! What was shall live as before." The strophe in vv. 13-15 fixes on the one great redeeming act of the Exodus as the pledge of future deeds of a like kind, as need requires. The language is deeply tinged with reminiscences of Exod. xv. "In holiness" (not "in the sanctuary"), the question "Who is so great a God?" the epithet "Who doest wonders," all come from Exod. xv. 11. "[Thine] arm" in the psalm recalls "By the greatness of Thine arm" in Exodus (ver. 16), and the psalmist's "redeemed Thy people" reproduces "the people which Thou hast redeemed" (Exod. xv. 13). The separate mention of "sons of Joseph" can scarcely be accounted for, if the psalm is prior to the division of the kingdoms. But the purpose of the designation is doubtful. It may express the psalmist's protest against the division as a breach of ancient national unity or his longings for reunion. The final strophe differs from the others in structure. It contains five verses instead of three, and the verses are (with the exception of the last) composed of three clauses each instead of two. Some commentators have supposed that vv. 16-19 are an addition to the original psalm, and think that they do not cohere well with the preceding. This view denies that there is any allusion in the closing verses to the passage of the Red Sea, and takes the whole as simply a description of a theophany, like that in Psalm xviii. But surely the writhing of the waters as if in pangs at the sight of God is such an allusion. Ver. 19, too, is best understood as referring to the path through the sea, whose waters returned and covered God's footprints from human eyes. Unless there is such a reference in vv. 16-19, the connection with the preceding and with ver. 20 is no doubt loose. But that is not so much a reason for denying the right of these verses to a place in the psalm as for recognising the reference. Why should a mere description of a theophany, which had nothing to do with the psalmist's theme, have been tacked on to it? No doubt, the thunders, lightnings, and storm so grandly described here are unmentioned in Exodus; and, quite possibly, may be simply poetic heightening of the scene, intended to suggest how majestic was the intervention which freed Israel. Some commentators, indeed, have claimed the picture as giving additional facts concerning the passage of the Red Sea. Dean Stanley, for example, has worked these points into his vivid description; but that carries literalism too far. The picture in the psalm is most striking. The continuous short clauses crash and flash like the thunders and lightnings. That energetic metaphor of the waters writhing as if panic-struck is more violent than Western taste approves, but its emotional vigour as a rendering of the fact is unmistakable. "Thine arrows went to and fro" is a very imperfect transcript of the Hebrew, which suggests the swift zigzag of the fierce flashes. In ver. 18 the last word offers some difficulty. It literally means a wheel, and is apparently best rendered as above, the thunder being poetically conceived of as the sound of the rolling wheels of God's chariot. There are several coincidences between vv. 16-19 of the psalm and Hab. iii. 10-15: namely, the expression "writhed in pain," applied in Habakkuk to the mountains; the word rendered "overflowing" (A.V.) or "tempest" (R.V.) in Hab. v. 10, cognate with the verb in ver. 17 of the psalm, and there rendered "poured out"; the designation of lightnings as God's arrows. 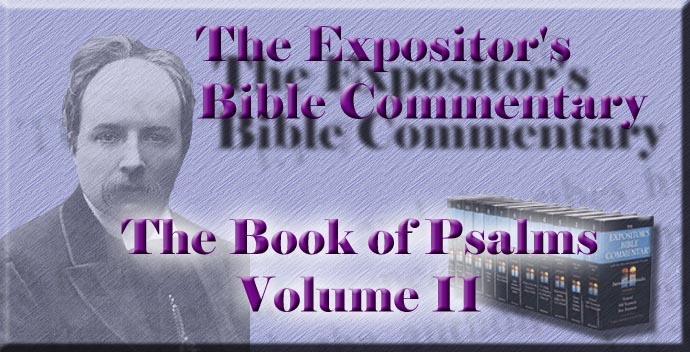 Delitzsch strongly maintains the priority of the psalm; Hupfeld as strongly that of the prophet. The last verse returns to the two-claused structure of the earlier part. It comes in lovely contrast with the majestic and terrible picture preceding, like the wonderful setting forth of the purpose of the other theophany in Psalm xviii., which was for no higher end than to draw one poor man from the mighty waters. All this pomp of Divine appearance, with lightnings, thunders, a heaving earth, a shrinking sea, had for its end the leading the people of God to their land, as a shepherd does his flock. The image is again an echo of Exod. xv. 13. The thing intended is not merely the passage of the Red Sea, but the whole process of guidance begun there amid the darkness. Such a close is too abrupt to please some commentators. But what more was needful or possible to be said, in a retrospect of God's past acts, for the solace of a dark present? It was more than enough to scatter fears and flash radiance into the gloom which had wrapped the psalmist. He need search no further. He has found what he sought; and so he hushes his song, and gazes in silence on the all-sufficient answer which memory has brought to all his questions and doubts. Nothing could more completely express the living, ever-present worth of the ancient deeds of God than the "abruptness" with which this psalm ceases rather than ends.